Asteroids was one of Atari's best selling coin-op games of all time. It was programmed and designed by Ed Logg who also played a large role in the creation of Centipede, another one of my favorites. The premise of Asteroids is very simple, shoot all of the asteroids to clear the level. As you shoot asteroids, they break into smaller and smaller pieces until they are removed from the play field. To make the game more challenging, it periodically sends flying saucers out that shoot at asteroids as well as the player. Asteroids was one of the first Atari games to use a vector monitor. Its crisp and bright lines really appealed to me as a kid (well, they still do today). 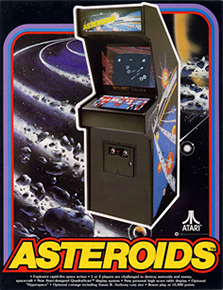 Asteroids was so popular that Atari halted its current production run of Lunar Lander and converted them to Asteroids (these cabinets are easily recognized by the circular style coin slot). As a kid I really liked the visual appearance of Asteroids, but was never as addicted to it as I was to other games at the time. To be honest, I played the Atari VCS/2600 version of Asteroids way more than I did the arcade game (sad, I know). However, today, I find Asteroids quite addicting. In fact, I enjoy playing it much more than games that repeat static level designs over and over (Pac-Man, Donkey Kong, etc.). I picked up my Asteroids from a Eugene-based Craigslist add. The game was listed as "partially" working, so the price was right. As soon as I saw the game, I quickly realized what the problem was. The vector monitor was blooming which is a sure sign of a bad HV diode. Once I replaced the diode, the monitor worked perfectly along with the rest of the game.